This building, now Highfields Church, opened in stages from 1900. 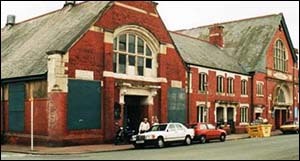 The original section, Crwys Hall Methodist chapel, is on the corner of Daniel Street. It was commissioned by the Cardiff Forward Movement, which had created 35 Methodist centres across Cardiff in the preceding eight years thanks to the energy of its superintendent, Rev John Pugh. The movement came under the Presbyterian Church of Wales (separate from England’s Methodist Church). Built in the fashionable Arts and Crafts style, the chapel cost almost £3,300. Charles Pierce, a wealthy bachelor and retired magistrate from Bangor, Gwynedd, donated £1,000. The new chapel could accommodate 1,000 worshippers, with seating for 300 in the adjoining lecture hall or schoolroom. The preacher at the opening service in May 1900 was the Rev J J Mackay, a renowned Scottish evangelist then based in Hull. This was followed by an afternoon concert by the Methodist choir and orchestra from East Moors Road chapel. The Christian Revival of 1904-05 increased chapel attendance across Wales. In 1906 the Pierce Hall, on the corner of Robert Street, was opened. It was named in memory of Charles Pierce, who had died, aged 79, in 1901. It had seating for 1,200 children at Sunday School! A three-storey building, the Women’s Training Institute, was designed for the space between the two halls. The Rev Pugh wanted a facility where young Christian women could train in Wales for work with the poor, instead of having to go to England or Scotland, but he died in 1907 and the institute was never built. A modest two-storey structure later filled the space, as shown in the photo - reproduced here by kind permission of Tony Cort. After the First World War, several memorials were unveiled in Crwys Hall to members of the congregation who had died in service. In 1997 the building was restored and the central section was rebuilt with a more impressive main entrance.